Sophomore infielder Tyler Hix attempts to tag freshman outfielder Cade Fergus during a drill. Updated: Feb. 11, 2019 at 4:43 p.m. Two-thirds of baseball’s starting field will likely be new faces once the 2019 season begins next week. The Colonials return 18 players from last season’s roster, but with a significant chunk of the team’s mainstays gone, GW will rely on some of the team’s freshmen to fill multiple gaps on the field. 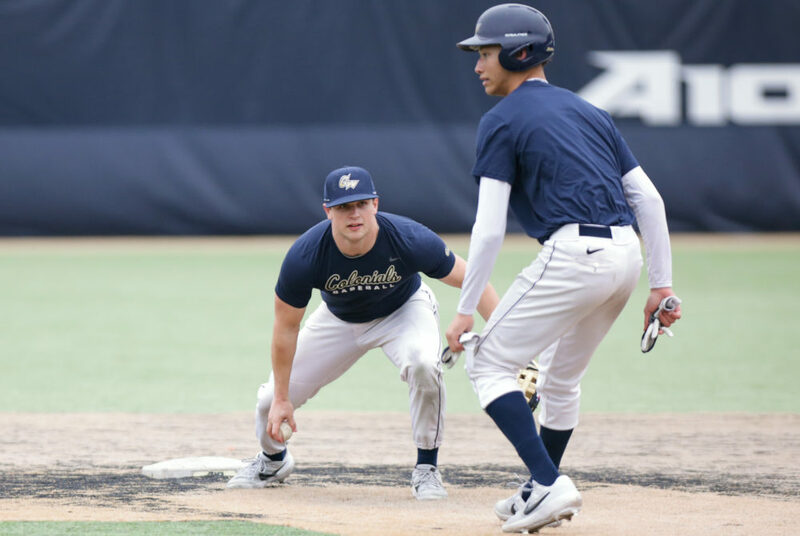 The infield was held down last season by then-seniors Matt Cosentino at first base, Robbie Metz at second base and Isaiah Pasteur splitting time between third base and the mound. But now Ritchie said that “developing power” will guide the infield with a primarily young lineup around the diamond and in the outfield. Ritchie said junior infielder Nate Fassnacht at shortstop will be the lone anchor for the team with an infield that is otherwise unsettled. “That is probably the only real position out there that does not have some kind of newness,” Ritchie said. Fassnacht, who has been a starter for the Colonials since his rookie campaign, said second base is now “pretty much open” to the team’s freshmen and although players are competing for spots, the team’s chemistry has been strong. “I know what they’re experiencing right now so it’s easy for me to help them out, give them tips like what I’ve experienced, learning from the mistakes I’ve gone through, what I’ve found out that worked really well,” Fassnacht said. Farther from the diamond, Ritchie tapped freshman outfielders Cade Fergus and Trey Torain as potential starters for the Colonials alongside returners like junior utility player Steve Barmakian, redshirt sophomore outfielder Colin Brophy and senior utility player Dom D’Alessandro – who all played significant roles on the team last year. But as the team has yet to see official competition, the first few contests will be spent testing out different combinations on the field to find the best starting lineup, Ritchie said. With plenty of movement and uncertainty happening in the field, Ritchie pointed to his squad’s defense as its early focus. Two seasons ago, the Colonials were one of the top defensive teams in the nation, finishing sixth out of all Division I programs with a .982 fielding percentage, but the Colonials dropped to 179th in the NCAA last season with a .967 fielding percentage. Ritchie said the team’s defense this year needs to “come up a notch” after last season’s performance. Expectations are high for the team’s starters across the board, but Ritchie acknowledged there will be a learning curve for the freshmen, transfers and the team’s new members of the coaching staff. Assistant coach and assistant recruitment coordinator Chad Marshall stepped into the role last month to replace Dave Lorber, who left the program in December to take a head coaching position at Stockton. The Colonials also added Steve Frank as director of baseball operations alongside volunteer assistant coach Jake Sidwell, who also joined the program this season.